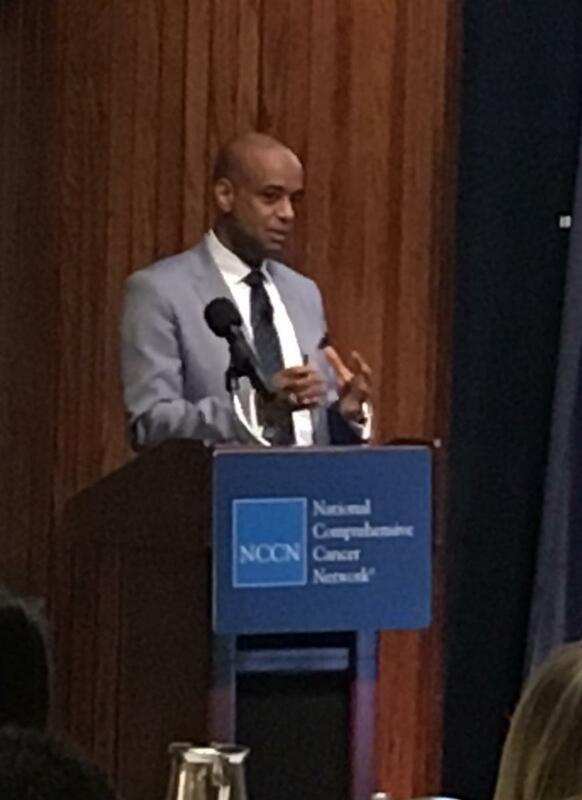 At the National Comprehensive Cancer Network® (NCCN)’s Patient Advocacy Summit – a meeting designed to share best practices for survivorship planning care among advocacy organizations – Yelak Biru shared his story of survivorship, and how he has been able to integrate multiple myeloma into his life for more than two decades. When he was initially diagnosed with multiple myeloma at the age of 25, doctors told Yelak Biru that the survival rate of people diagnosed with multiple myeloma was one to three years. Now, this rate is between seven and 10 years and Biru is into his twenty-third year of living with the disease. Cancer is no longer considered a death sentence. And since people like Biru are living longer after their cancer diagnoses, they need to be able to plan for how their lives may look after treatment. Biru credits his extraordinary survival to the advancements made in medicine in recent years — including nine drugs that have been approved for multiple myeloma since 2000 — but also to the high level of engagement he has in managing his cancer care. He tracks his medical history carefully, ensures that his doctors communicate with each other about his care, and takes advantage of support groups and resources to address non-medical issues and learn about the experiences of others like him. Biru has become an advocate for people with multiple myeloma and for patients with cancer in general, and serves as an example of how an informed and engaged patient can increase their chances of longer and healthier survival. At the National Comprehensive Cancer Network® (NCCN)’s Patient Advocacy Summit – a meeting designed to share best practices for survivorship planning care among advocacy organizations – Biru shared his story of survivorship, and how he has been able to integrate multiple myeloma into his life for more than two decades. He believes people who are diagnosed with cancer could benefit from more direction in building a “survival team.” They should seek out specialists who address their specific kinds of cancer, and then make sure that the specialists and primary doctors communicate well. Biru urges survivors to embrace their “new normal” of life after cancer. Concerns about relapse, cancer stigma and insurance issues always loom large. Seeking support from providers and advocacy organizations can help survivors move forward. Biru said he wished that he had had more coaching on aspects of survivorship including the possibility of sterility, sexual consequences, depression, and loneliness following his diagnosis. He also raised three key issues regarding quality of life that patients with cancer may need help in managing: loss of time – which includes the time spent on visiting doctors and accessing treatments – financial toxicity, and pain management. The panels and presentations at the Patient Advocacy Summit expanded on the topics Biru introduced in his speech. He also joined one panel entitled, “A Viewpoint on Cancer Survivorship from Patient Advocates,” which reviewed the progress, obstacles, and opportunities faced by the survivorship community. As an active cancer patient advocate — he is a member of the International Myeloma Foundation Board of Directors, a member of the ECOG Myeloma Committee, a voting member of the NCI Myeloma Committee, active in the Global Myeloma Action Network, and a facilitator of the SmartPatients.com myeloma group — Biru is helping to enable progress toward improving access to life-saving cancer drugs globally, and advancing the innovation pipeline through research and patient participation.